The Szépmûvészeti Múzeum is the largest fine arts museum of Hungary. The core of the Old Masters' Gallery collection is composed of the Esterházy Gallery, which, though its history goes back to the 17th century, gained its final form at the end of the 18th and in the first decades of the 19th century. 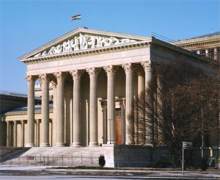 The 637 painting transported from Vienna to Pest in 1865 were purchased by the Hungarian State in 1871 and thus the National Picture Gallery, housed in the edifice of the Hungarian Academy of Sciences was founded. Into this collection was the gallery of the Hungarian National Museum incorporated which, besides the Jankovich-collection included those 192 paintings which János László Pyrker collected in Italy as a Venetian patriarch and donated to the nation in 1836 and also those 78 paintings which got to the Castle of Pozsony from the Imperial Collection of Vienna in 1770 to go on to Buda and later on to the National Museum. The National Picture Gallery was enlarged as early as 1872 with 64 paintings, the gift of Arnold Ipolyi, scholarbishop. Károly Pulszky, a man of a wide intellectual horizon, the director of the legal predecessor of the Museum of Fine Arts completed the collection now gaining European rank with gap-filling purchases between 1884-96. Six years after the opening of the present building of the museum in 1906 the collection was considerably enriched by the bequest of 121 paintings of Count János Pállfy. Between the two World Wars besides the symmetrical purchases there were generous donations as well. Some of the paintings carried to Germany during World War II and transported back in 1945-46 were damaged, and some, luckily not from among the masterpieces, were lost. You can contact the museum at its web site. Study of a Man by El Greco.